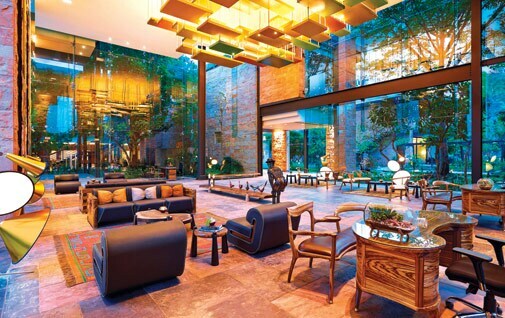 A stone's throw away for those seeking to escape the grit and grime of Delhi, The Gateway Resort near Damdama Lake caters to families and business professionals alike. Bangalore's got its gardens and Mumbai's got the sea, but Delhi has to contend with the odd park in the midst of a sprawling concrete jungle. It's the honking of cars, not birds chirping on your window sill, that rouses you every morning, and if studies are to be believed, the air here is getting thicker than gravy. Even if its residents agreed with experts about the health hazards, they didn't really have a choice but to spend their weekend indoors in the company of table-top air purifiers. Until the Taj decided to do something about it, that is. Today, a veritable oasis has opened up across 20 acres of greenery in the lap of the Aravallis, a mere 60 minutes' drive from the city. Here, you can switch your mobile phone off and, from the lap of luxury, watch the sun sink into the mountain range with nary a thought spared for deadlines and contracts. Or, if you want to stretch your legs, clamber up the rocks to reach the highest point of the neighbouring hilltop and gaze down at thread-like roads winding through miniscule villages to the bank of a British-era water body. After all, everything needs recharging, man and machine. 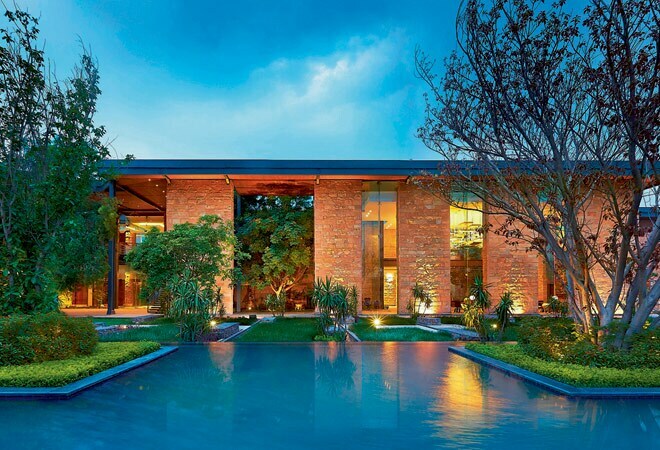 Tag along for a tour of the greenest five-star property in the neighbourhood. You wake up at 5.45 am, a good fifteen minutes before your alarm rings, and you wonder when was the last time that ever happened. You blink, then switch on the table lamp to find yourself snug under the blankets in a den that's as cozy as it's spacious. Admittedly, your room is no presidential suite at the Hotel Cala di Volpe-Italy, but that's in keeping with the Gateway's philosophy of achieving luxury without indulging in excess. And it's a philosophy that can be witnessed across its expanse, whether it is cobblestoned paths snaking through groves of dark green or huge glass windows that let the great outdoors into your bedroom with a subtle tug at the curtain strings. Minutes later, you find yourself jogging down a charming lane with quaint villas lining its sides, wondering if you should work out at the gym or go hiking in the mountains. After some thought and a couple of pancakes at Buzz, the in-house coffee shop, you head for higher ground. You return a few hours later, sweaty and creaking at the joints. The climb had been exhilarating, and although aided by able guides through it all, you never felt mollycoddled at any point in time. "What now," you wonder, "Should I head back to my suite for another shower, or wander around till I find the spa?" Thankfully, this one's an easy choice to make. As it turns out, there was a lot that missed the eye upon your arrival the previous evening. Take, for instance, the raw Jodhpur stone that goes into its exterior finishing or landscape walls made with local Delhi quartzite. Even the architecture of the restaurants here is inspired by the geometry of the snail, and it's the buildings that make way for the trees, not the other way round. It's then that you see the cattle, clothed in a familiar form but noticeably different from the herbivores you know. For one, they aren't moving, and second, they are made of metal. "Recycled metal, to be precise," says Mayank Mittal from the resort. "Look carefully, and you will notice that they are made of discarded automobile parts. For instance, the head of that bull happens to be the fuel tank of a Yamaha bike." The lobby doubles up as a museum of exotic paintings and installations. Okay, recycling. The resort philosophy. You find more art installations near the fountains at the resort entrance. Metal storks that look quite like the real thing, but won't be flying to Siberia anytime soon. At the lobby, you come across cast iron bugs and caterpillars that have clearly crawled out of a discarded tractor, which are quite impressive indeed. But wait, weren't you supposed to be heading to the spa? Don't blame yourself for losing your way; the resort can be quite a distracting proposition. Now, you don't really know if Vincent Vega's million foot massages for a million ladies really meant anything, but the one you get at the spa here sure does. After a deep tissue massage that rubs away every trace of tiredness from your bones, you head for the highly anticipated eight-course Haryanvi lunch at Buzz. Like everything else at The Gateway Resort, even the cuisine here is inspired heavily by its cultural surroundings. With a homemaker recruited from the nearby Damdama village at the helm of its kitchen activities, it redefines the "ghar ka khaana" phenomenon while, at the same time, fulfilling the resort's mantra of soaking in the local flavour. After gobbling up some delicious Damdama macchi and Palwal chicken curry, you end the meal with a satisfying bowl of rabdi and head back for a nap. Owing to a wake-up call from the reception on the dot of five thirty, you push the covers aside with some difficulty - knowing well that there is a lot more for you to catch up with before sundown. You start with the property's much-touted adventure zone, a vast space dedicated to physical activities that probably belong in a military training academy. The commando net, which requires the participant to impress onlookers by crawling over to the other side on a spider web of sorts, turns out to be easy enough. Pride welling up in your chest, you then attack the wall climbing structure with gusto, only to lose steam halfway and drop to the ground with an embarrassing thud. "Vertigo," you mumble, looking around red-faced. You skip the Burma bridge (more potential for embarrassment there) and head to the archery section, where a couple of well-aimed missiles in the vicinity of the bullseye helps lift your spirits a little. "Hope you feel better now," the trainer says with a wink, "An evening at Swirl should bring you back to form." Can't ignore good advice, can we? By eight, you're at the property's in-house bar where you proceed to drown your cares in quaint little cocktail glasses. A whisky sour, with generous helpings of bourbon and lime, helps calm a still-thudding heart. You ask for the Twilight Flinch, a truly exotic cocktail of vodka, schnapps and mango puree. But wait, is that the annoying voice of reason creeping into your mind again, telling you to stop? Ignore it and call out for a dirty martini; it's not like you are driving home anyway. The rest of the evening is a haze. You vaguely recall downing your eighth drink, politely refusing the attendant's entreaties to drop by Sian (their oriental restaurant), then stumbling through a blitz of light and sound to collapse heavily onto your bed. You go limp in a cocoon of comfort. For a place that exhorts you to slow down and smell the flowers, the Gateway Resort does make for a pretty packed day.